I’m proud to say that I have been doing an excellent job of keeping my diet since the New Year started! I am a firm believer in having “cheat meals” once a week to keep myself sane, as well as helping with weight loss. Since I have been sticking to grilled or baked proteins, my cravings have been for fried foods – at least it’s not sugar yet (must be the coconut oil cutting my sugar cravings). I have always been a big fan of mozzarella sticks, so this weekend I decided to make my own. 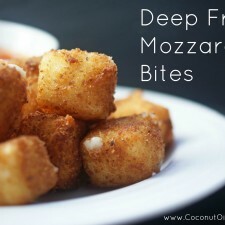 Instead making traditional mozzarella sticks, I did bite size portions and I switched the process up by using coconut oil instead of vegetable oil. Coconut oil is great to use for deep frying, from churros to fried chicken, the flavor is absolutely amazing. When it comes to deep drying, it is important to make sure your oil is hot enough. With an unrefined coconut oil, like the one I use, you will have to make sure to keep the temperature between 325-375 degrees. The smoke point of an unrefined coconut oil is lower than a refined coconut oil, but I’m a firm believer in using unrefined to keep the natural health benefits. The best way to ensure your coconut oil stays between 325-375 degrees when deep frying is by using a candy thermometer or a fryer with a heating dial. Once heated, you’ll want to drop one of the mozzarella balls into the oil. If nothing happens, then the oil is not hot enough, so wait a few more minutes before trying again. Once the correct temperature is achieved, the mozzarella ball should sizzle and produce tiny bubbles. 1. Cut mozzarella into 1-inch cubes and set aside. Next, place 3 shallow bowls beside each other and fill the first with flour, the second with eggs and milk, and the third with breadcrumbs. 2. Roll each mozzarella ball in the flour, tapping off any excess flour, then dip in egg mixture, then roll entire mozzarella ball in breadcrumbs and place on a plate. Repeat this process with remaining mozzarella balls until all are coated. 3. In a large skillet, heat 2-inches of coconut oil to 350 degrees F. You’ll want to use your candy thermometer for this process. Set a large plate lined with paper towels to the side, which will be used to soak up any excess coconut oil. 4. Before starting the frying process, be sure to follow the steps previously listed on testing your coconut oil for frying. 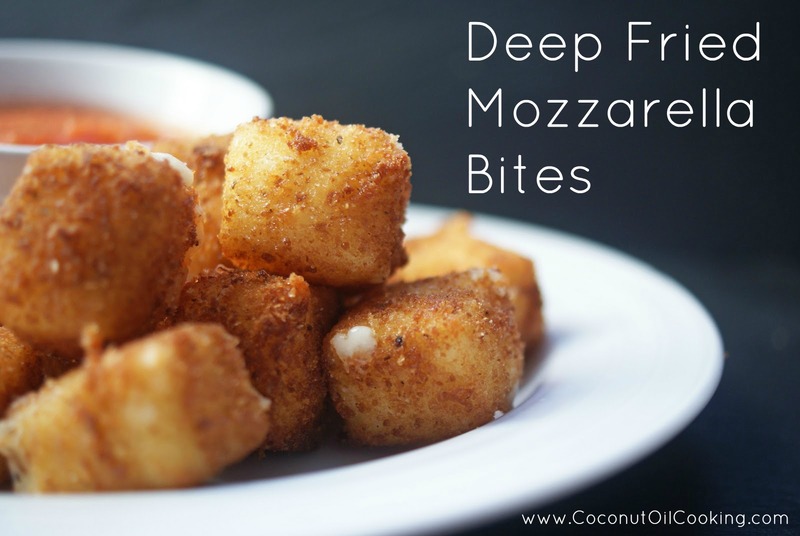 Using a slotted spoon, lower a few mozzarella balls into the coconut oil, making sure that they stay separated when frying. 5. Using a spoon, remove the mozzarella balls from the oil after 1 minute or when balls are golden brown. Place on paper towels to drain. 6. Let coconut oil return to 350 degrees F before making the next batch. Repeat this process until all mozzarella balls are fried. 7. Heat marinara sauce of your choice on a stove top until warm and sever with fried mozzarella balls. Enjoy! This little snack was actually fun to make and a huge hit with my boyfriend and friends!